The video is a fine example of the high plateaus in the Sierra Nevada. It’s also a great source to identify what wildflowers we are shooting way up in the high country!! If you haven’t experienced one of the high plateaus, you can find them with a topo map or by using Google Earth to place your viewpoint on top of some of the highest peaks to look down on the plateaus. Look for easy access places such as the Saddlebag Lake area and near the west entrance of Yosemite. You won’t find anything growing higher then a sky pilot! This entry was posted on September 17, 2011 at 10:29 am and is filed under Uncategorized. You can follow any responses to this entry through the RSS 2.0 feed. You can leave a response, or trackback from your own site. Interesting and beautiful! Thank you for sharing this. Nicely framed, a lovely place. I couldn’t get video to work may be because I am on a Mac. It worked OK on my Mac. You might try going directly to YouTube: http://www.youtube.com/watch?v=yneADYBWRvs&feature=player_embedded#! This video, post and your image help us get a large view sense of the high plateaus of the Sierra and the joy they can bring to photographers. 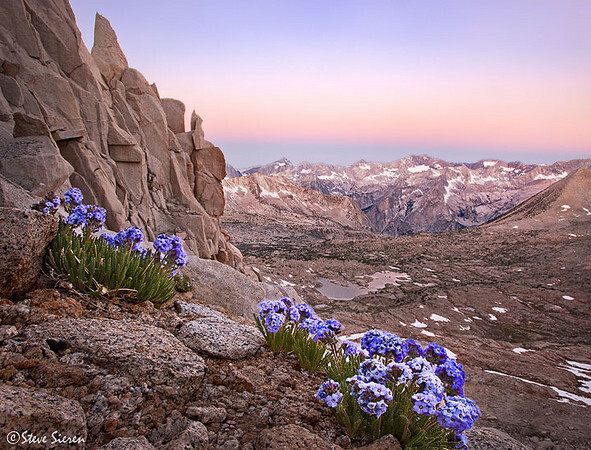 The wide profusion of color among the rocks is one of the features that make the Sierra memorable.